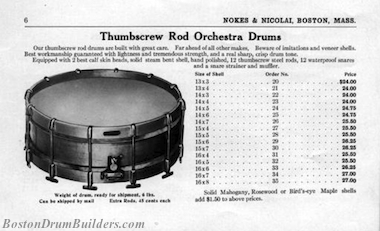 New to the collection is a Nokes & Nicolai Thumbscrew Rod Orchestra Drum. After a gentle cleaning and polishing, and the addition of two new calfskin heads tucked onto the original flesh hoops, this drum is up and rolling once again. It is a simple but elegant instrument built around a one-ply maple shell. As the name would suggest, this is a single tension drum tuned by using thumbrods which pull down on both heads simultaneously. The drawback to this type of tuning system of course is that the heads can not be tuned independently from one another. 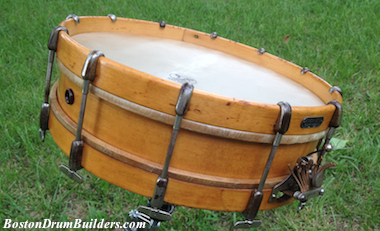 When this drum was produced in the mid 1910s, however, single tension drums still had a significant following of drummers who either preferred the convenience of tightening both heads with the turn of a single screw, or were stuck in their old ways and weren't ready to accept the change over to separate tension drums which were fast becoming the industry standard on high end models. 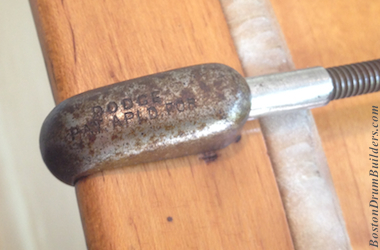 This particular example appears to date from earlier in Nokes & Nicolai's existence, not too long after they had succeeded the F. E. Dodge Company. This much is suggested by the fact that both the snare throw-off and one pair of the rim clips are stamped with wording indicating that patents are pending. These markings are absent from hardware on later instruments as the patents were evidently never granted and the earlier 'patent applied for' stamped hardware were eventually used up. This drum is of particular interest to me because it completes a 'set' as pictured in Nokes & Nicolai American Drummer No. 5. 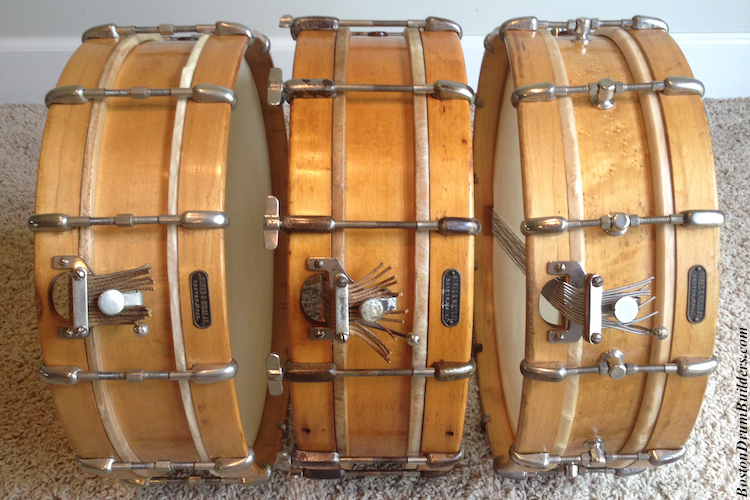 Do you have a Nokes & Nicolai snare drum? I'd like to hear from you! Feel free to send me an email at lee@vinson.net. 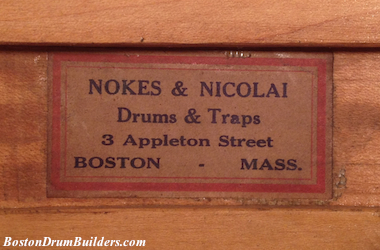 And for more on Nokes & Nicolai and their predecessors F. E. Dodge, please visit BostonDrumBuilders.com.